HERMISTON - The Hermiston Bulldogs lost to the Richland Bombers on Saturday, January 3, 2009. The Richland Bombers took immediate control of the game in the early minutes of the first period leading 5-0 in the first minute and half. 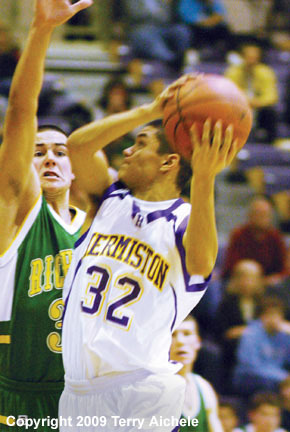 Then Cody Meeks of Hermiston was fouled on an attempted three point shot. Meeks made three of three freethrows to make it a 3-5 game. 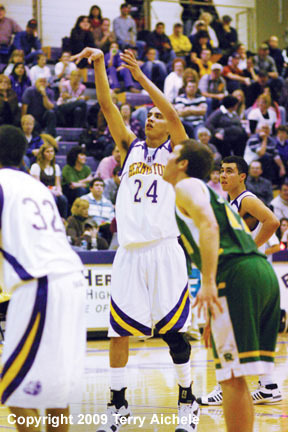 Less than a minute later Hermiston tied it up on Luis Ortiz hitting two freethrows 5-5. Meeks hit a layup and Hermiston had their first lead 7-5 with 5:43 to go in the period. The lead swung back and forth between the Bulldogs and Bombers until the three minute mark when Richland took and held the lead through the end of the period 17-16. 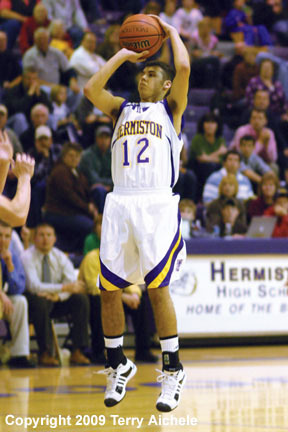 Hermiston hit two three pointers in the opening moments of the second period. The Bombers were held to only two points for three minutes in the middle of the period. 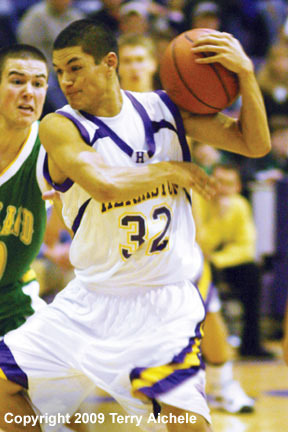 Hermiston held onto a four point lead all the way to halftime score of 36-32. Richland outscored Hermiston 23 to 12 in the third period taking a 55-48 lead. 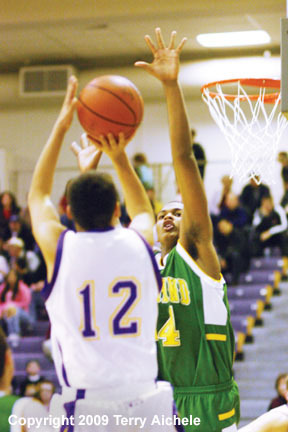 Hermiston was stuck on 41 points for four minutes while Richland scored 13 points during the Dawgs dry spell. The Dawgs clawed their way back to being down by two, 60-62 at the 3:49 mark of the fourth period. Bulldog players intentionally fouled over the closing minutes of the game but they were unable to take command of the game. Bomber after Bomber went to the line and hit enough freethrows to keep a clear lead over the Dawgs. The Dawgs were down by three with five seconds to play when Cody Humphrey took the last shot, a three point attempt that missed. The Richland Bombers took the win by a score of 70-67. 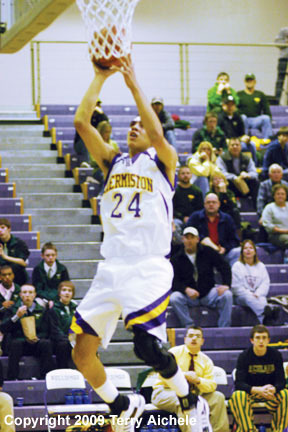 LEFT - Cody Meeks of Hermiston drives in for a layup during the first half of the game Saturday. RIGHT - Hermiston's Luis Ortiz drives through Richland defenders on his way to the basket during the first half of the game Saturday. 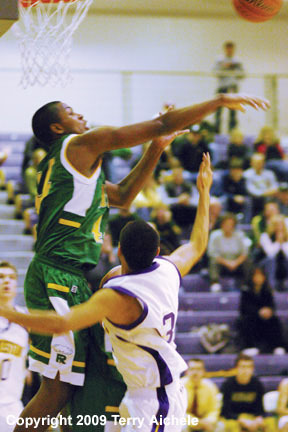 LEFT - Luis Ortiz battles Richland defenders beneath the basket as he attempts to take a shot. RIGHT - A Richland defender smacks the ball away from the hoop. 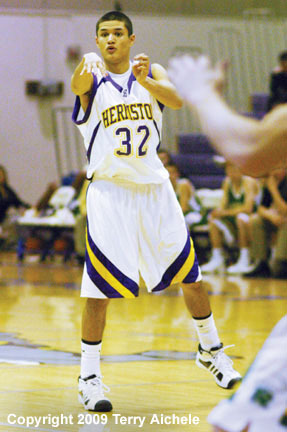 LEFT - Hermiston's Cody Meeks hits a freethrow in the first half of the game Saturday. RIGHT - Bradley Irwin of Hermiston takes a jump shot during the game on Saturday. 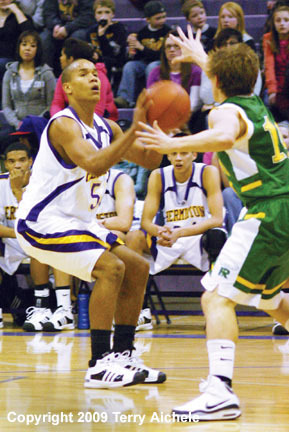 LEFT - Bradley Irwin of Hermiston attempts to take a shot over a Richland Bomber defender. RIGHT - Luis Ortiz passes the ball late in the fourth period.